Ironing your clothes is a task that’s usually performed without much thought. You pull out an ironing board that may have been a hand-me-down item, and start flattening out those clothing items. Today’s ironing boards, however, come with many different features. You aren’t just limited to a basic board with wobbly, metal legs. In fact, there are functional and stylish ironing boards just waiting to be discovered. From ergonomically shaped to compact boards, consider some of today’s best features on this household necessity. You may never pull out that 1970s ironing board again. When consumers name this ironing board the luxury-vehicle model of the industry, it’s time to sit up and take notice of the Tital Oval design by Brabantia. This beautiful ironing board has a cover design that’s indicative of a pebble breaking through a water surface. Rings in various sizes spread out across the board, which makes this product stand out from the rest. It’s not just beauty that makes this board a number-one choice among consumers. In fact, it has many other features that give it the most functionality out of all of the available models on the market. Discover the Brabantia ironing-board difference today. The first feature that might stand out in your mind is the 10-year guarantee. Brabantia places an expensive price tag on this board, but it lives up to that cost. If you have any problems with the ironing board during its first 10 years of use, the manufacturer will back the product up with repairs or replacements. There are very few manufacturers that place this kind of guarantee on their products. The board is built with quality and longevity in mind, so that guarantee reflects this feature. Simply keep your receipt, and don’t hesitate to contact the manufacturer with any questions. This ironing board has a classic shape to its design in order to be functional with different types of clothes. Use the wide, shoulders for dress shirts while reserving the pointed end for pant legs. The edges are smooth and soft so that they don’t catch onto your clothes as you slide them across the surface. For most ironing jobs, you’ll probably have several shirts and pants to fix up. The manufacturer keeps this fact in mind, and the basic ironing-board design was born from it. At times, you might iron some larger items, such as blankets. Because this board is marked as a size “D,” it’s the largest model that’s available on the market. In fact, it has a nearly 18-inch width. You’ll have ample space to iron out those large items without constantly moving them across the board. If you use a narrow board, those large items might overwhelm the surface and cause instability to the legs themselves. If you have young children roaming the household, you’ll appreciate the included child-safety lock. Secure the lock in place, and the ironing board won’t accidentally snap closed. This scenario is possibly damaging to young children, especially if they’re close to the folding legs. The lock is easily seen on the underside of the board as you stretch it open. As you gaze down at the board’s unique cover design, you’ll notice that there’s a dark area marked off along the shoulder section. This area is referred to as the heat-resistant section. Lay the iron down on this area, and you won’t have any singe marks or hot spots. The manufacturer knows that you’ll probably lay the iron down during some part of your ironing shores. In that case, this area is perfect so that you can avoid any fire hazards. You might have a dozen shirts and pants to iron at one time. This chore can take awhile, depending on your family’s size. As a solution to your fatigue, the Brabantia board can be stretched between 24- and 40-inches tall. Stand up at the 40-inch mark, or sit down with the 24-inch height. You can easily iron in either of these positions as you take care of the family’s laundry. 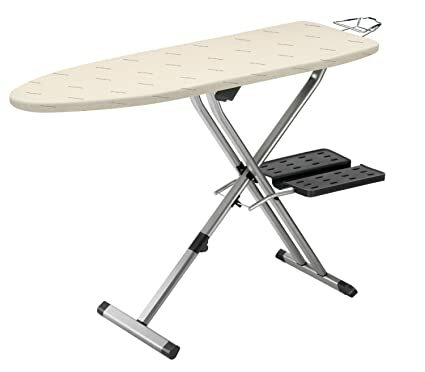 Although many other ironing boards offer several height variations, this model makes it extremely comfortable to iron while you’re sitting down. When you’re not fatigued, you can safely iron for an hour or longer. When you purchase any ironing board, it’s a smart idea to look at the frame and cover. You want high-quality materials in both of these areas because they’re hallmarks of a good design. The Brabantia board, for example, has a cover that’s more than just cloth material. In fact, it’s a mixture of felt and foam. You’ll have a cushioned surface that’s also firm enough for those most stubborn wrinkles. The steel tube supporting the board and cover is nearly 1.5-inches thick. Heavy items and strong ironing pressure won’t warp these legs at any time. The steel construction should last for many years with normal use. Some consumers may not be aware of this attribute, but the Brabantia board has a memory feature. When you lock the board into place, it can remember this setting. Fold the board and store it away. As you return to your ironing duties, you can fold the board back out to the same height setting. If you tend to do the laundry for the most part, you’ll appreciate this height setting. You’ll be able to finish up the laundry in no time. Ironing will be a pleasant task with the help of this stylish board. When you’re looking for a reasonably priced ironing board, look for the LUX aluminum model by Perilla. This board has a classic cut to its shape, but comes with a fun cover to stand out from the competitors. You’ll also notice the distinct legs that support this 37-inch tall ironing board. This product is perfect for infrequent to moderate use around the home. Discover what it can do for your family’s ironing needs. Take a close look at the ironing board’s legs. It actually has four legs that are widely set from one another. Consumers report that this board is very sturdy for its lightweight structure. You also have more stability because the legs have silicone stoppers at their base. Set the board on carpet, linoleum or hardwood, and you’ll never have any slipping issues during an ironing task. When you’re done with the ironing, simply fold the legs up into the board where they remain flush with the material. You’ll love the decorative cover that comes with this product. Colorful circles dot the cover as they progress to the board’s pointy end. These details simply make the ironing board fun to use and hang when it’s in storage. In fact, some households might hang the board in an open setting in order to enjoy the circle design. The cover isn’t just basic cotton fabric either. It’s a fine, mesh cover that allows you to iron almost any material with professional ease. Because it has a mesh design, the cover doesn’t heat up as quickly as other materials. It can distribute the heat so that your clothes can emerge with no wrinkles or frustrating creases. You’ll only have creases where you designate them to be, such as along pant legs. One of the most distinct details about this ironing board is the rest found at the shoulder’s edge. This ironing rest is metal and shaped perfectly for any iron model. As you lay the iron down during your chore, you normally tilt it upright on its back end when there is no rest area available. However, this iron orientation often means that the hot side is open to burning your hands or arms as you maneuver a piece of material into position. The rest forces the iron off of the board entirely and allows it to rest in a downward position. You can move the fabric to any position on the board because you don’t have to worry about the hot iron touching your skin. A concern among some consumers is the rest’s permanency on the board. You cannot remove or fold it down. If you want to fit the board into a tight corner, the rest might be a problem. Because the manufacturer doesn’t advertise the board’s length, you may want to be flexible with this purchase and place it in a wide-open area. The rest’s position won’t be an issue in that case. Upon closer inspection of the Perilla ironing board, you’ll notice that the legs have an attractive, dark sheen to their curves. In fact, the manufacturer proudly uses an electrostatic epoxy powder in order to cover the metal with ease. You won’t have any issues with cracked or chipping paint because the electrostatic process makes the color almost a part of the metal itself. It’s important to note that the mesh fabric across the board will allow some steam through it. With this fact in mind, you can lay silk and other fine fabrics on the board and iron them with ease. Other boards might be prone to singing silk if you use a high setting on the iron. The Perilla board gives you some versatility during your daily ironing chores, especially if an unexpected high setting is activated. You’ll walk away in relief as your fabric remains undamaged and free from unsightly wrinkles. Mixing a professional-grade ironing board with a compact, folding size is nearly impossible for most products. You get the best of both worlds when you purchase a Rowenta Pro Compact ironing board, however. When you first glance at this board, you’ll notice that it’s simplistic by design. However, simplicity is worth a lot when you try the large, ironing surface out for the first time. Give this ironing board a chance, and you might fall in love with the Rowenta-design strategy. The manufacturer advertises this ironing board as compact to store, but it does have a hefty weight. At 20 pounds, you’ll need some muscle to fold this board away and hang it. If the board is meant for someone with little arm strength, such as a senior living at home, you may want to reconsider this model. Its weight allows it to be sturdy as you use it, but moving it might be difficult. When you have a dedicated area for the ironing board, you can leave it out on a regular basis if you desire. Most consumers are thrilled with the ample, black rests that reside at about knee level on the board’s legs. Place your steam station on these rests, and work without any space issues on the ironing surface. Steamers can take up nearly half of the ironing board in some cases. This rest area is a simple yet ingenious addition to the Rowenta board. Look above the knee-level rests, and you’ll see another rest for the iron itself. Place the iron in this area as you turn or flip a piece of material. Its metal design cradles the iron so that it can’t tip over if you bump it. When you aren’t using the rest for the iron itself, it’s a perfect location for hangers and clothing. This one detail is enough to tempt the most skeptical of consumers. Be aware that you can’t remove this rest once the board is assembled, however. It’s a permanent part of the design. 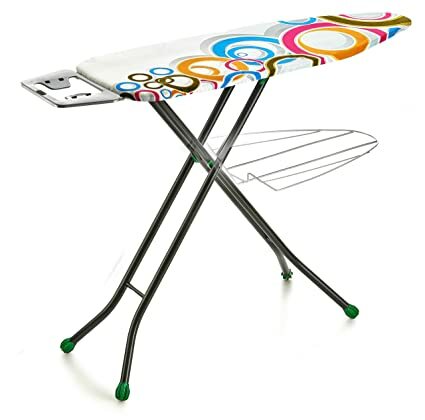 The ironing surface itself is a large, 18-by-54-inch section. You can place shirts, skirts, dresses and linens on this ironing board with no balancing problems. The cover itself is also of high-quality. It’s made completely of cotton and has a thick construction. You’ll feel like the iron is passing over a cloud as it straightens out those wrinkles and creases. The board’s legs are a highlight feature too. Rectangular tubes form the legs with a double support at the midpoint along the board. The rectangular shape gives the metal legs a better support system than just the circular design. It’s more difficult to damage the rectangular legs compared to the circular types. As a result, you’ll be able to use the ironing board for many years with no dings or damages along the leg section. Consumers recommend that you treat the Rowenta board with care when you’re folding it closed. Plastic inserts that guide the rails can crack or snap under too much pressure. Simply follow the directions, and you can have a board that works well with each ironing session. The Rowenta brand is meant to last for a generation or longer. If you’re used to your grandmother’s old ironing board, you can still have that same design in the T-Leg Foam-Pad board by Homz. Pull it out of the box, and you’ll be greeted by classic, white legs and a green cover. As a budget pick, the Homz model has its advantages and drawbacks. You simply need to decide which features are important to you before you make that final purchasing decision. Explore the Homz ironing board, and you might find a perfect match for your needs. You’ll recognize the nostalgia built into this ironing board when you unfold it. The classic, t-leg construction greets you with a wide base. Each leg has two covers protecting them from marring your floors. The entire assembly is adjustable, and it reaches a maximum height of 35-inches tall. For most consumers, this height is ample to ward off any back pain during use. It’s important to note that this ironing board is meant for basic shirt, skirt and pant needs. The board is only 13-inches wide, which makes it very narrow compared to the larger and more expensive models. If you simply need a basic ironing board for your apartment, however, these dimensions might be a benefit instead of a drawback. One major benefit of this ironing board is the cover. It’s 100 percent cotton with an old-fashioned green hue to its design. Underneath the cover is a foam pad that works perfectly with sheer or delicate fabrics. The cotton and padding work together so that your ironing surface is as smooth as possible. Some consumers have reported that the padding is too thin, but most buyers agree that the padding matches the price point on the board. A concern that’s inherent to this design is instability. The classic t-leg may be normal for ironing boards of the past, but it does have stability problems. In fact, consumers report that the stability is on the verge of being wobbly at times. The wobbly factor might be due to an uneven floor, poor assembly strategy or other issues. The Homz board isn’t normally a shaky surface, so you should consider both the positive and negative comments on this product before making a decision. Many consumers have no wobbly problems at all with the classic t-leg design. Because this ironing board weighs less than 15 pounds, almost anyone in the household can fold and lift it. It’s lightweight design makes it perfect for seniors, for example. The 53-inch length also makes it compact enough to store in a tall cabinet, such as a pantry. 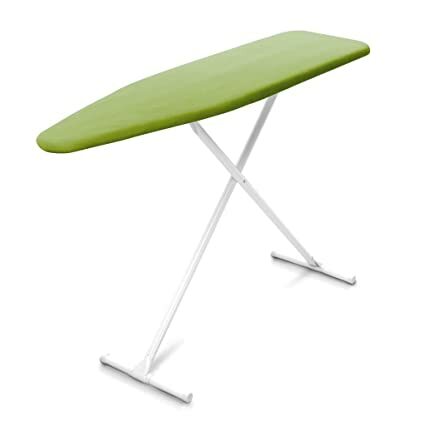 Lightweight and compact factors are often desired features in a quality ironing board. Use caution when you pull this ironing board out from the shipping box. Consumers have reported that some pieces might break off of the board as the cardboard slips around the contours. With some caution during assembly, you can have an ironing board that’s strong for infrequent use. From college students to single individuals, this ironing board is an overall smart pick for busy people. As you look at various ironing board models, consider the legs’ design first. You want wide-set legs that support the board under its center point. Some models may even have four separate legs that spread out underneath the board. With several contact points on the floor, you’ll have greater control over the board’s stability. If you notice that the ironing board becomes wobbly over time, some screws may be loose or misaligned. Take some time out of your schedule so that you can fix the stability issue. A normally stable board can remain so with some maintenance help. The board’s shape is an important consideration during your research because it determines the type of clothes that you can adequately work on across the surface. In most cases, you’ll find boards with shoulder and pointy ends. Other designs have some ergonomics built into the material, such as a concave edge for your body shape. The board’s size is also a shape consideration because it can range from size A to D, which indicates small to large sizes. A busy household can use a large size compared to a college student who really only needs a small, “A” size, for instance. The board’s color design may not be a major concern to most consumers, but you should think about the colors and shapes before purchasing the ironing board. Some bold prints may bleed through your ironing materials. Consumers report that they mistook a cover print for a wrinkle on their clothing. Cover prints are attractive, but they may make ironing a bit more difficult. The cover’s quality, such as foam padding, should also be examined because this surface quality directly impacts the ironing’s efficiency with each session. If you plan on moving the ironing board around a lot, be sure to pick out a model with a light weight. These models are usually smaller, but they allow you to move them with ease. Heavy-duty ironing boards are meant to stay in a laundry room in order to serve the entire family. Hauling a heavy ironing board around will only be cumbersome, and it might cause some injuries over time. Always read about a product’s weight before you purchase it. Manufacturers should have this information handy at all times. Ideally, build a reasonable budget for your ironing-board purchase. You don’t want to buy the cheapest model on the market. Look at this ironing-board purchase as an investment. If you use the board each day, it can still last for many years. It may become a valuable hand-me-down for your family’s needs too. Select a board that works for most of your everyday ironing needs, and keep it in good shape through the years. Wash the cover if possible, and keep the leg screws securely tightened. As a result, you may never need to buy another board for many years to come.